As part of the “London Protocol” agreed in 1944, Berlin was divided in to 4 sectors, each sector under allied control (USA, USSR, GB and France). However, Berlin was located deep inside the Soviet controlled East Germany, and therfore in a postion to be blocked by land. The start of the journey towards the blockade began in January 1947, when the British and Americans combined their 2 seperate zones in West Germany, to become the Bizone (France then merged their zone in April 1949, to become the Trizone). The Soviet Union had no desire to see a strong Germany, as was agreed at the Potsdam Agreement. So at this stage, differences between the former allies on the future of Germany were starting to appear. In March of 1947 US President Truman, annouced his “Truman Doctrine”, aid to any country that wanted help to contain communisam. This was in response to Soviet meddling in Greece and Turkey. March 1948, and the US Congress vote for the Marshall Aid plan (an initiative to aid Western Europe in economic recovery), which was perceived by the Soviet Union as an attempt to undermine their influence in Eastern Europe. June 1 1948, America and Britain annouced that they wanted to see the Bizone become West Germany. 23 June 1948, America and Britian, introduce a new currency (the Deutsche mark) into the Bizone and West Berlin. 24 June 1948, the Soviet Union closes all road and rail traffic in West Berlin between the British, US and French zones and from western Germany. The Britsh started the airlift with Operation “Knicker”, 28 June, to supply the British Garrison. But it soon became apparent that the wider Berlin population also required supplies. On 29 June operation Knicker became operation “Carter Paterson”. This was soon changed in name to operation “Plainfare”, when it was discoverd that the Soviets deduced that the British planned to withdrawl from Berlin, as an “Carter Paterson” was the actual name of a removal company. 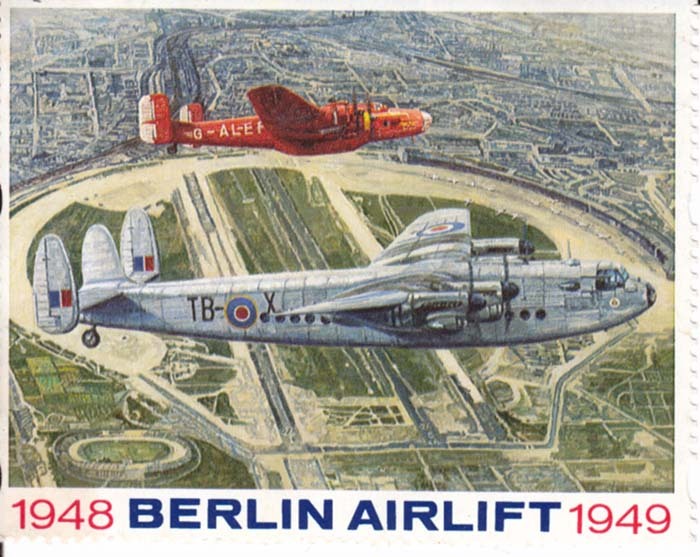 The unofficial name for the Berlin airlift from the Americans, was operation “Vittles”. 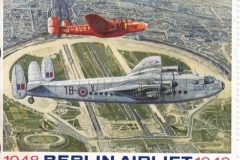 The Berlin Airlift lasted for nearly a year, starting on 24th June 1948 and ending on 11th May 1949. A total of 394,509 tons of supplies were flown in to Berlin. 83,405 tons and 68,000 people were flown out of Berlin. 441 USAF, 147 RAF and 101 British civil aircraft were used. 39 British, 31 Americans and 13 Germans lost their lives participating in the Airlift. A total of 277,804 flights were made. Royal Air Force DC-3 Dakota, No 46 Squadron. United States Air Force C-47 Skytrain, 94th TG, 86th TFW. The C-47 was a support aircraft for the Wing. On 22nd October 1948, a gift of 7,000lb of sweets was flown to Berlin as a gift for children of Berlin. United States Air Force Fairchild C-82 Packet, 60th TCG, 12th TCS. The Fairchild Packet was the 1st ever twin boom cargo aircraft.